When you're sailing--you'll find tranquility, you'll find serenity, you'll find the joy of innocence again! 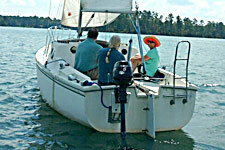 Residents of Columbus, GA and the surrounding areas--enjoy this unique opportunity to sail at Lake Harding under the tutelage of the Chattahoochee Sail Club! First, you'll learn the rules and tools of safe sailing and then enjoy a fun, shoreline picnic. Next, if the wind is right, you'll spend the rest of your day sailing away! Only 12 seats available. Register now!